Air strikes by US planes on the largely Sunni Iraqi city of Samarra have killed at least 13 people and injured 84, a hospital official in the city said. The US military said it had killed "about 50 insurgents" in strikes which began after midnight (2000 GMT Friday), following arms searches on the ground. 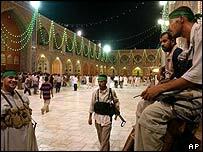 Reports speak of at least 13 deaths overnight in the Shia city of Hilla and unrest has affected oil exports. Talks to firm up a truce in Najaf have broken down, the Iraqi government says. "I feel deep sorrow and regret to announce the failure of the efforts we have exerted to end the crisis in Iraq," said Mouwaffaq al-Rubaie, the Iraqi national security adviser. Mr Rubaie had been in talks with representatives of radical Shia cleric Moqtada Sadr to build upon a truce which took hold on Friday, after a week of fierce fighting with US-led forces in the Shia holy city. 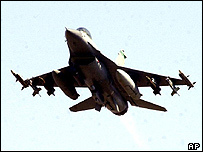 Residents of Samarra, in the volatile "Sunni triangle" north-west of Baghdad, said US bombs struck two houses in separate districts, the AP news agency reported. US jets have repeatedly targeted militants in the "Sunni triangle"
The US military said a number of 230 kilogram (500-pound) bombs had been dropped on "known enemy locations" near the city. "Initial reports indicate that approximately 50 anti-Iraqi forces were killed during a series of operations near Samarra on 14 August," a US military statement said. A spokesman added that troops had detained three suspected weapons suppliers and seized a number of weapons. But Dr Abdul Hamid al-Samarrai told AFP news agency at the main hospital that most of the casualties were women and children. At least 43 buildings and homes were destroyed in the city which also came under attack from the ground as US forces searched for weapons before the bombing, the agency reported. Gutted vehicles lined city streets after the assault, it added, and the main police station was also damaged. Samarra, about 95km (60 miles) from Baghdad and with a population of about 200,000, has long been a stronghold of elements opposed to the US-led occupation. Iraqi government sources said between 13 and 50 people were killed in clashes in Hilla after gunmen loyal to Moqtada Sadr tried to seize government buildings on Friday. Hospital sources confirmed that gunmen, police officers and civilians were among the dead and wounded. Polish troops deployed in the area were involved in the violence, finding themselves besieged by militants at one stage when they came to the assistance of the police. Gen Qais Hamza Aboud, the chief of police, told AFP news agency the gunmen were still holding two police stations on Saturday and he vowed to drive them out. The city of 500,000 had largely escaped the uprising in Shia cities inspired by Mr Sadr and his Mehdi Army militia before Friday. Officials in Iraq's vital oil industry shut down a major export pipeline in the south over fears of unrest in the city of Basra, sources told Western news agencies. "The situation in Basra is bad," one South Oil Company official, who did not wish to be named, told Reuters on Saturday. "Management ordered the pipeline shut late yesterday." The official added that workers were staying away and there was a "feeling [it was] not wise to challenge Sadr's followers". "The Americans say these were known enemy locations"